Choosing the right college isn’t just about getting an education. It’s about finding a place that gets you ready for a career and a lifetime of service to others. 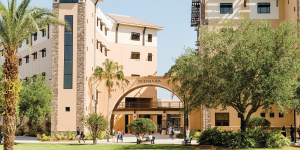 Southeastern University gives youthe foundation needed to succeed in life, not just at work. SEU has more than 80 degree programs to choosefrom, as well as a real community where you’ll build relationships that will last a lifetime. We recently opened our 125,000-sq. 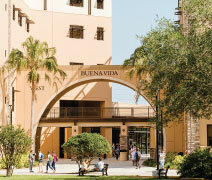 ft. Buena Vida live/learn facility that includes new residence halls, visual and performing arts spaces, a Bloomberg financial lab, and a food court. Construction is also underway for a brand-new welcome center. Your spiritual development is the very core of our mission. Through chapel services, mission trips, community outreach, faith integration inthe classroom, and much more, your faith will be strengthened daily. Our student-led worship band writesoriginal songs, leads chapel services,and professionally produces albums every year. 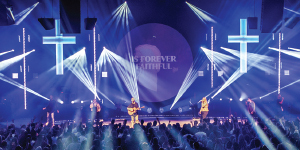 As of summer 2018, SEU Worship had reached more than 13 million streams on Spotify. College is a significant investment, and we provide numerous financial aid options to make SEU accessible toall students. Our average SEU awardis $15,500, and more than 98% of our students receive financial aid. In fact, we awarded more than $27 million in scholarships in the 2017–2018 academic year alone. Our campus is in sunny Lakeland, Florida, where students are treated togreat weather and outdoor activities throughout the year. Lakeland has just the right balance of hometown connectivity and city-based excitement. SEU is also centrally located to some of the nation’s best beaches as well as theme parks such as Walt Disney World, Universal Studios, and Busch Gardens. The Fire compete in 16 sports in theNAIA, with 14 of them belonging to the Sun Conference. Football and wrestling compete in the Mid-South Conference. SEU has won multiple conference championships in the past few years. In fact, in the 2017–2018 season, the Fire women’s basketball team was ranked #1 nationwide. In spring 2018, SEU Fire baseball made school history by becoming the firstSEU team to secure a national title—they won the NAIA World Series! After the series, three players were chosen in the 2018 MLB Draft. One of the greatest parts of our community at SEU is the mentoring ourstudents receive. From faculty to staff to coaches, we have no shortage of people at SEU who are ready to guide you in your academic and spiritual walk.